The shape and the position of the ear lobes have a huge effect on the look of the whole face. Ear deformities and their wrong positioning, wide set ears (“dumbo ears”), low set ears and such like, are congenital deformities, which can often be seen right after the birth of a child. This kind of appearance can be at the root of deep unhappiness and of a complex of lower self-worth. As by age 5, the ear lobe has developed 85%, this operation is possible even at this early age and any psychological problems or bullying at school in the future can thus be prevented. These deformities can be only on one, or on both sides, they can be symmetrical or asymmetrical. There are more than 15 different deformities of the earlobe which we could list here, but the most common is the increased angle of the earlobe with relation to the head. If this angle is 15-30 degrees, then this is deemed as normal, if the angle is over 30 degrees, then this is regarded as a deformity, and anything over 50-70 degrees is deemed as a significant deformity. This is the name of the operation which corrects the deformities mentioned above. It is interesting to note that there is no other operation in the field of aesthetic surgery which has so many different methods and modifications. Many of the methods of otoplasty pioneered by prof Boško Milojević, the doyen of aesthetic plastic surgery in Croatia, are still used to this day, even though they were first described over 20 years ago. Wide-set ears, ear deformities, large earlobes, hypertrophic earlobes, asymmetry. The operation lasts about one hour. Before the start of the operation, it is important to make careful measurements of the earlobes, so that the results achieved are symmetrical. The ears are immobilised after the operation, but the bandages are removed after 24-48 hours. It is essential at this stage that the wound is cleaned every second day. The stitches are removed after 7 days. Any swellings or bruising do go away after 10 days and normal sensation of the earlobes returns after a few weeks. 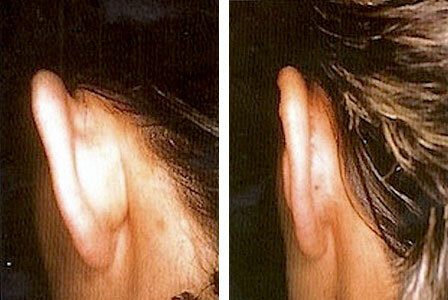 Otoplasty scars are hidden behind the ear and are not ever visible.